Since the first Phantom appeared in 1925, Rolls-Royce Motor Cars has had its ups and downs. When the outgoing Phantom appeared at the stroke of midnight on January 1st 2003, the company even called it ‘the last great automotive adventure’.Maybe that should have been penultimate, because we’ve just driven the new car, and as internal combustion most likely won’t be around in another 14 years’ time, this really could be The One.Rolls-Royce reckons the Phantom is the barometer by which everyone else in the world of expensive luxury goods measures themselves, so the bar isn’t just raised here, it’s bejewelled and platinum-plated. You know when someone claims to be ‘the Rolls-Royce of watches/furniture/granite-kitchen-worktops’? 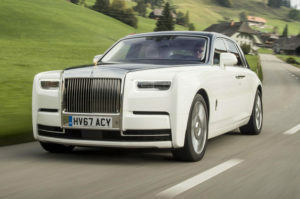 Well, this is the Rolls-Royce of Rolls-Royces.Rolls says the Phantom’s new spaceframe structure is 30 per cent more rigid than the previous model, a figure that rises significantly in key areas such as suspension and gearbox. This new structure, coincidentally, offers sufficient flexibility to underpin the next wave of Rolls product, its SUV included.The chassis gets an all-new suspension setup, with a double wishbone configuration on the front, a five-link axle at the rear, adaptive dampers, and active anti-roll bars. It’s also the latest car to benefit from four-wheel steering, whose three degrees of counter-steer help shrink the car’s heft at higher speeds, as well as improving low-speed agility. The Phant’s air springs feature bigger chambers than on any previous Rolls, and the tyres are specially developed Continentals whose structure incorporates 2kg of sound absorbent material. The major exterior highlights on the Rolls-Royce phantom are that it has got fresh adaptive LED headlamps providing a very contemporary look. At the same time the light clusters has a shimmering bar of LED daytime running lamps. The paintwork on this vehicle is so smooth that you would certainly notice your reflection clearly on it. This car comes with 12 diverse wheels in 5 different designs with about 3 finishes and is accompanied with their individual and unique traits. The wheels are designed in such a way that they are unique and self-righting wheel centres exhibiting the Rolls Royce logo the right way up. The Rolls Royce Phantom Coupe measures 5834 mm in length x 1989 mm width x 1633mm in height. On the other hand the Drophead Coupe measures about 5839mm in length x 1992 mm wide and 1641 mm in height. The wheel base of phantom extended is 3571mm while same for the Coupe version is 3820mm. When it comes to the interior, you might find that, somehow, Rolls managed to really bring some serious change into the fold for this generation and has made the Phantom more modern than ever. The interior of the Phantom VII was really more of an acquired taste with its overly flat and uneventful face, those weird, minivan-line glass panels in the A-Pillars, and a center console that reminds of something you might see in a van. It’s not that it wasn’t elegant, it was just really dated for a model with this kind of credentials. But, that problem is no more, as Rolls really did go above and beyond what most of us here at TopSpeed really expected. Oddly enough, the dash still has the same general boxy shape, and what more could you really ask for, as it really does match the exterior design. But for this generation, there are lots of new little goodies up front. For starters, the upper tier of the dash is now known as “The Gallery” and is home to artwork that can be chosen by customers at the time of customization – talk about luxury.Moving beyond that, those old, classic, and dated gauges ahead of the steering wheel have been replaced by an all-digital unit. And, before all of you start losing your minds, take a look at it. Rolls did an excellent job at maintaining the classic look as much as possible, with the digital gauges imitating the analog gauges of the last-gen models. You’ll find what appears to be the same circular HVAC vents, but hose in the center have now be dropped down to sit below the infotainment display and above the CD changer controls. The HVAC controls down blow still feature the same horizontal temperature controls, but the knobs are now smaller and sit above them, while the physical buttons sit much higher. Ultimately, this reorganization and general refinement has allowed for a much cleaner look while everything is much closer together and easier to access by both the driver and the front passenger. The steering wheel is all new, with those funky buttons below the hub replaced by sleeker thumb units. The upper side spokes also get thumb buttons – something the last-gen model didn’t have. All three spokes are shorter than before, making for a slightly smaller wheel, while the lower spoke is now hollow in the center. The center console is also heavily revised with the front portion sitting a bit higher than before and the armrest unit leading the way with a knob controller for the built-in infotainment system. That arm rest, by the way, is now a single-piece unit as opposed to that weird dual-opening design from before. The seats get a new stitching pattern while the doors are layered with glossy wood trim and chrome inserts – an absolute must in a vehicle of this caliber.Moving to the rear, there’s a whole lot going on here as well. Obviously, space is of the utmost importance, so there’s plenty of that. You get the clever and unique LED lighting in the room, while the center console in the center gives rear passenger their very own space. As such, each gets their own climate controls on their respective doors, and curtains mounted to the glass allows for some extra privacy as long as you don’t mind your driver seeing what you’re doing. In the rear of the front seats, there is a pair of picnic tables as well as rear theatre monitors, both of which are electronically controlled and concealed behind the glossy wood trim. The rear seats can be changed at the time of customization, with options like an intimate lounge seat, individual seats with a concealable center console, and a newly introduced sleeping seat, which as you probably guessed is likely to be the most comfortable option. Even with a powerful engine, Phantom is not a speed car. It is a sedan that has a top speed of 249 km/h that is quite low considering the car’s price and the powerful V12 engine. The mileage of the car is also something that it cannot be proud of. The mileage of the Phantom is around 9 kmpl on the highway which means Phantom needs a lot of gasoline for every breath its engine takes. As far as handling is concerned, there is nothing better than driving a Rolls Royce car, with great suspension systems at both the ends and a smooth steering control, the Rolls Royce Phantom runs like a cloud floating on the air bed. Considering that the 2016 Rolls-Royce Phantom weighs as much as a Chevrolet Suburban, handling composure is rather remarkable. We have yet to sample a Phantom with the Dynamic package, but we’ve been pleasantly surprised by the ultra-luxury sedan’s athleticism in previous tests. The steering is light and communicative, and the Roller feels confident around turns thanks to its well-sorted air suspension. There’s no getting around its enormous dimensions, however; in close quarters or on tight roads, the Phantom can be a bear to maneuver.The V12 is strong and nearly silent, making full acceleration a somewhat eerie experience from the driver’s lofty perch. It’s ultimately not that powerful, but it’s incredibly smooth. Ride quality, meanwhile, is truly regal. The Phantom’s suspension is supple yet controlled, dispatching bumps, potholes and even speed humps as if they weren’t even there. The company has given this Rolls-Royce Phantom model series a set of innovative features, which makes it one of the safest vehicle in its class. This car is made of advanced aluminum sub-frame, which is hand welded from over five hundred spare parts. It is incredibly light but strong and is both stiff along with dynamic. Its body structure is combined with state of the art suspension technologies and the smooth power delivery, which creates the air cushioned magic carpet ride that is unique to Rolls Royce. It features an advanced infotainment system that features several informations for keeping the driver updated and gives a stress free driving experience. Apart from these, it also has seat belts for all occupants along with warning notification, a strong and tough body, anti lock braking system along with electronic brake force distribution, smart access card entry and so on. It is blessed with eight airbags along with front co-passenger airbag deactivation function that adds to the safety quotient. The airbags including side, curtain, head and neck keeps you unharmed from major injuries in case of any accidents or collisions. In addition to these, it is bestowed with front and rear parking sensors along with small cameras in front bumper combined with side cameras that offers a clear views on the road in either direction. The rear path prediction setting guides reveals the potential obstacles in all direction that makes it quite easy for parking the vehicle even in peak traffic conditions. The electronic engine immobilization device comes with security alarm that safeguards the vehicle from theft and any unauthorized entry. The company has also given this luxurious model series a lot of standard features like reliable braking mechanism, follow me home headlamps, traction control, electronic stability control, centrally mounted fuel tank, impact beams and lots of other aspects as well. That’s a difficult question to answer, especially if the price of a minimally specced Phantom, after paying nearly 200 percent in taxes and duties, is expected to cost Rs 8 crore (on road), rising to around Rs 9.5 -10 crore for a car with a decent amount of customisation. Terms like ‘value for money’ and ‘bang for your buck’ are not part of a Phantom buyer’s lexicon. What they are looking for is the ultimate luxury car and one that they are unashamed to flaunt. The new Phantom also takes customisation and exclusivity to a different level, with its concept of the bespoke Gallery. View the Phantom not just as an automobile but also as a work of art which, with its ludicrously high price tag, might just start making sense, but only if you are a billionaire.Apply car loan for Rolls Royce Phantom.